Here is another one of my favorite family artifacts that was passed down by my grandmother, Grace Ware (Holbrook) Haskell. This cross stitch sampler was created by Emerline Mason, b. 7 Sept 1807 to John and Elizabeth "Betsy" (Ware) Mason. Emerline m. Joel Nourse, Jr. on 22 June 1822. She d. 16 Aug 1842, Worcester, MA at age 35. Joel and Emerline had two children, Henry b. 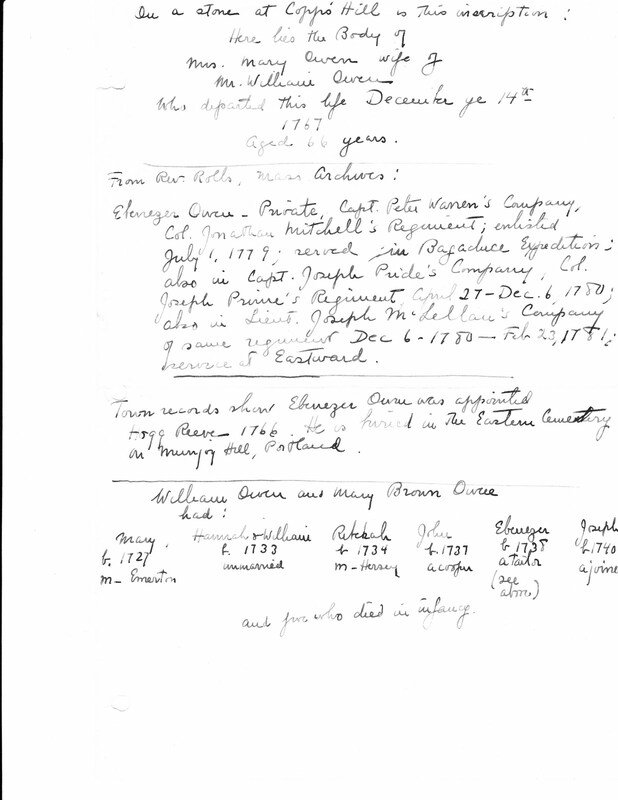 21 Sept 1831, Shrewsbury, MA and Anna Elizabeth b. 10 Feb 1836, Worcester, MA (my line). Emerline is my third great-grandmother. There is no date for when this sampler was made. Not sure of the relationship to my family, but I liked the stone. 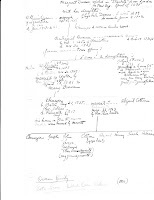 Town records show Ebenezer Owen was appointed Hogg Reeve 1766. He is buried in the Eastern Cemetery on Munjoy Hill, Portland. Sarah Jane (Haskell) Woodman is the daughter of Amos and Sarah (Johnson) Haskell, b. 12 Nov 1821 in New Gloucester, Cumberland County, Maine. She married Alfred Woodman 13 Dec 1846. Transcription: SARAH JANE/wife of/ALFRED WOODMAN/DIED/Nov 1, 1848,/AE. 27. Cousin N Torrey at Upper Dutton ? 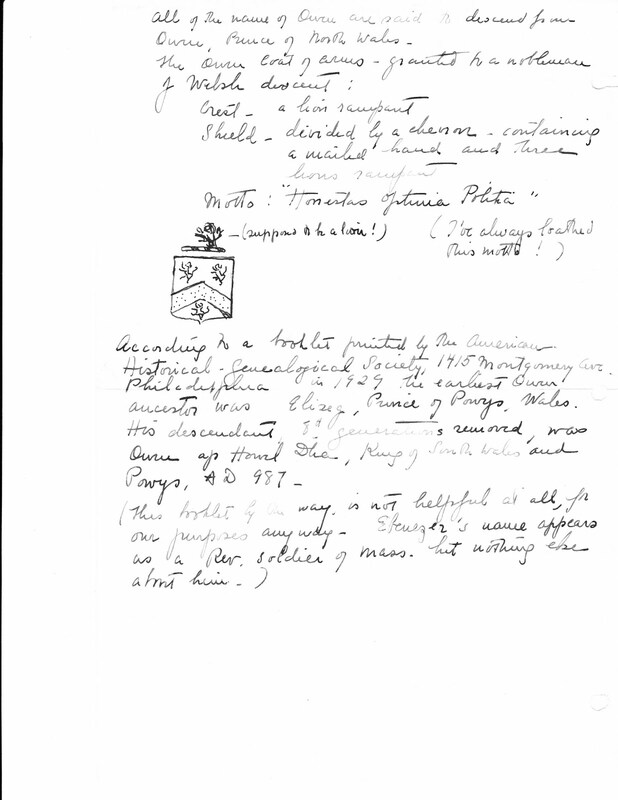 Subject Name: Levina Cabot wife of Marston Cabot, Esq. Marston Cabot, son of Rev. 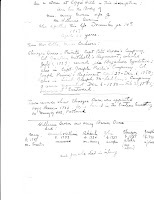 Marston and Mary (Dwight) Cabot married 25 Nov 1788 widow Levina (Sabin) Smith of Pomfret, Connecticut. Levina was b. 29 Apr 1754. Marston owned a farm of 4,000 acres in Hartland, Vermont. He died there 12 Apr 1814. His wife Levina d. 31 Mar 1818. 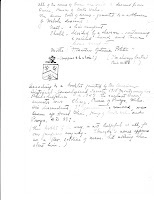 Transcription: IN/memory of/Widow/LEVINA CABOT/Relict of the late/MARSTON CABOT, Esq./who died/March 31, 1818./AE. 63. 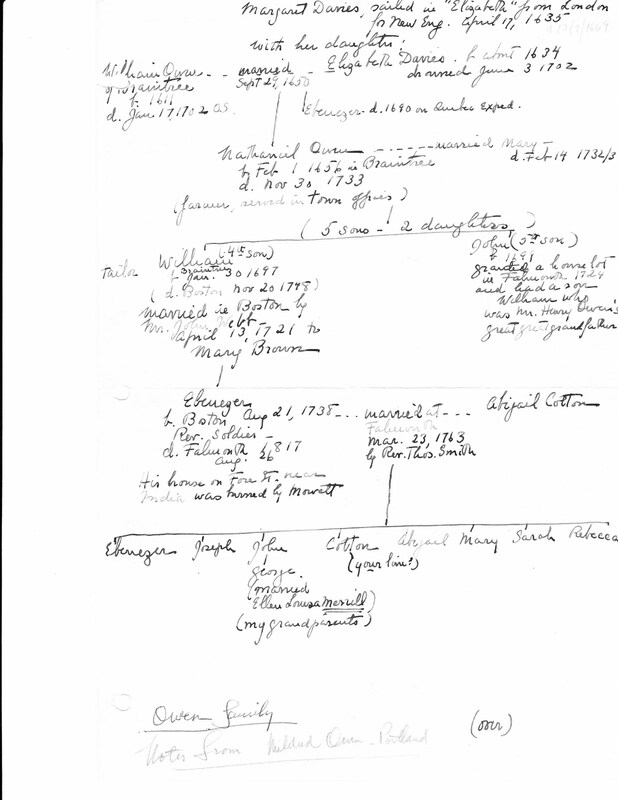 This handwritten family tree was attached to the Owen Family Letter found in my grandmothers Haskell Family Genealogy Binder. The Maydells left at seven o'clock for New York, and all but Miss Lubovistky arose to breakfast with them and to see them off at the station. Later in the morning Miss Kehl, Michael and I went to the village in the Franklin to do errands and call on Aunt Molly. Michael drove the car for the first time on the way home, and poor Miss Kehl did not enjoy the strain of watching the process. Michael & I went to walk, by Robbins Farm to the Black Mountain Road and back through Dummerston. We talked of many things - of Russia, America, traveling, families and friends. At the end we were more congenial - having more in common than before. In the afternoon and evening it rained a little, and grew very cool at night.